Many times patients with short hair complain about the scar that has been left in the donor area from previous hair transplant surgeries. The hair loss restoration surgeons at DiStefano use the Individual Graft Technique™ to apply individual follicles to camouflage a widened donor scar. 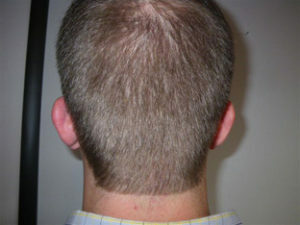 In this technique, hair is extracted from around the area of the linear scar and then placed directly into it. IGT™ is also used in patients who have a normal line scar, but decide to wear the hair in the back and sides of their scalp very short. In this case, the grafts removed through direct extraction can be placed directly on and around the scar to hide it. Sometimes patients have an extremely wide scar in the donor area. In these cases, the surgeon can cut out the scar and suture the area closed using a trichphytic closure. In this method, one side of the skin is prepared so that hair follicles will grow through the incision line to cover it.